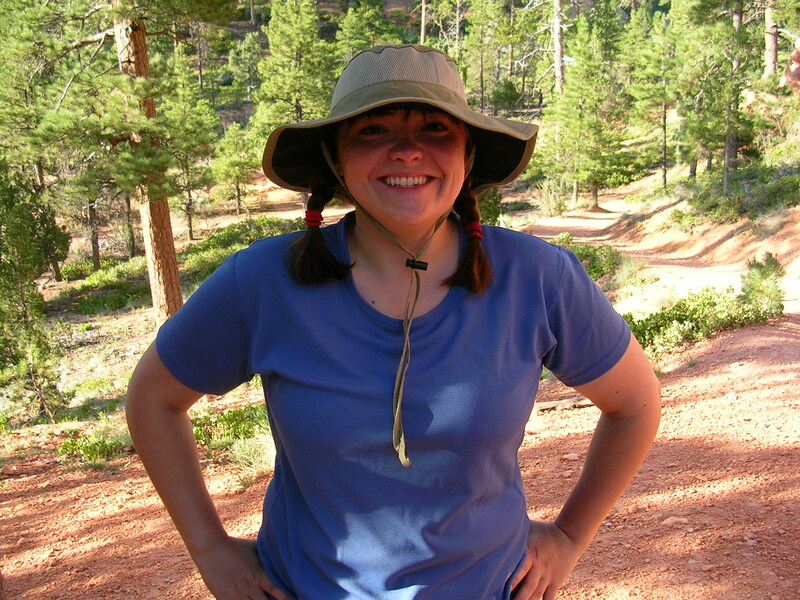 This week’s Friday Feature is the final fabulous member of my writing group: Lisa Palin. Lisa Palin, esq & writer! I’m not any one thing (but who is, really?). I’m a professor of legal research and writing at Northeastern University School of Law. I’m a Kaplan LSAT teacher. I’m a godmother to a brand new baby girl. I’m a hiker/camper/outdoorswoman. My favorite places on Earth are Zion National Park in Utah, Paris, Disney World in Orlando, and Brown University (my alma mater). I’m a lawyer who, until last year, specialized in insurance coverage litigation. And I’m a writer. I primarily write young adult fiction, but also blog, write about traveling, and have dabbled in other types of creative fiction and non-fiction. I’m also a semi-crazy person. So now to the “other days” part of you: what were you doing until just recently? 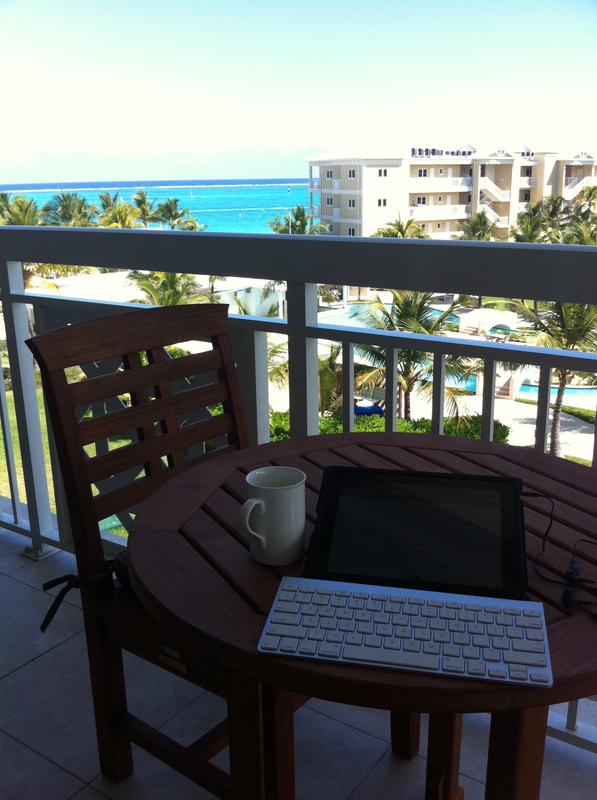 Lisa Palin’s ideal writing location: “Turks and Caicos, on the balcony of my room, looking out at the ocean.” …ah, the tough life of a writer! What day is today? November 23? Then it has been exactly one year and twenty-one days since I walked out (amicably, with lots of notice and to great fanfare) of my job as a large-firm litigation attorney to pursue a career in writing and teaching. Since then, I have done some traveling, finished a novel, attended a writing conference in L.A. and a television festival in Austin, and started an M.F.A. program. Yes, I’m in my first semester in the Writing for Children program at Simmons College, and so far it rocks. It’s exciting and challenging, and I’ve already learned things about myself and my writing that I would never have gotten by taking short-term classes. One of the great things about the program is that I’m surrounded by people who simply get it when you say you write young adult or middle grade fiction (by the way, my completed novel is a thriller about a teenage spy, and my current project is a contemporary puzzle mystery about a missing girl). (They are both awesome.) But back up a minute. You QUIT YOUR JOB TO BE A WRITER. Tell us a little more about that. Are there any tips you have for someone contemplating a similar move? 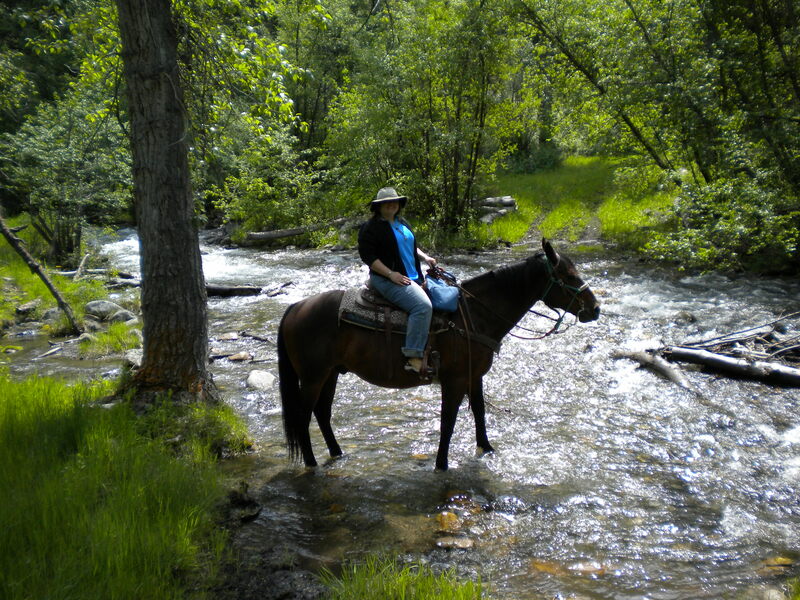 Lisa Palin, at a dude ranch with unidentified horse. Despite the excitement and exhilaration, leaving a secure job in favor of the unknown was scary and hard. I like adventure (such as dude ranch vacations, solo hiking roadtrips, and jaunts in foreign cities), but I also like knowing there’s a safety net. I’ve dealt with that (and am still dealing with it) by copious planning, giving myself plenty of pep talks, and relying on my friends and family for moral support. (1) Have savings to live on for long enough to get off the ground. It might be a long while before you have positive income, so save long and hard. Be realistic about your budgetary needs. (2) Have contingency plans. What types of jobs can you get to forestall the depletion of your savings but that won’t get in the way of your goal? For example, I’m teaching for Kaplan and teaching a course in Legal Research and Writing at a Northeastern University School of Law; these are jobs I love, and that require attention, but allow me time to focus on writing. (3) Leave your career on solid footing. Give plenty of notice, don’t burn your bridges, and make allies. (4) Have an idea of where you’re headed. Simply jumping into the “I’m going to write novels” abyss rarely works out for anyone. I have levels to my pursuit: the M.F.A., teaching experience, writing fiction, and freelancing. I’m also looking into and laying groundwork for other writing-related sources of income. Diversity is your friend. This has been a risky move, but one that is worth it for me. One day, I may go back to the law, but I’ll do it knowing that I made a solid attempt to pursue my dream of writing fiction for children and young adults. The foundation I’m laying now will, at the very least, help me reach my goals in the future even if I return to a full-time position. Thanks so much, Lisa & good luck with your many continued pursuits! Thanks for having me on the blog, Tara! You and your readers can find me on the web at www.lisapalin.com. I also have two blogs: one on creative writing (www.creativelyunhinged.com) and one on solo hiking and camping for women (www.hersideofthemountain.com), but they are both on hiatus during my fist intensive semester of school.